Jackson Quinn would be happy to assist you in the administration of an Estate whether you have been appointed as Executor under a Will or would wish to act as Administrator under the Intestacy Rules. Whether there is a Will or not the person dealing with the Estate is under a legal duty to maximise the assets, minimise the liabilities and distribute as much as possible to the persons entitled to a share of the Estate. After the death of a friend or a relative, it will be necessary for their Estate to be dealt with. 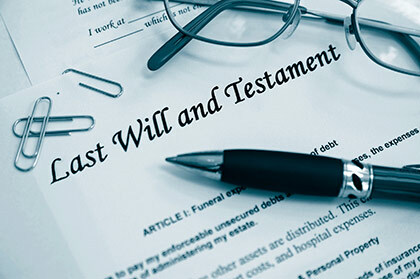 If the deceased left a Will, then this will set out who they have appointed to be the Executor and Trustee of their Will. If you have been appointed as the Executor then we can advise and assist you in relation to this role and the process of applying for and obtaining a Grant of Probate. During this process, we will assist you to ascertain the value of the Estate, apply for the Grant, collect in the assets, pay debts, finalise any tax affairs, transfer property and prepare Estate Accounts and thereafter distribute the Estate to the beneficiaries. If the deceased died intestate, we will discuss with you who can apply to take on the role of Administrator and assist you in applying for a Grant of Letters of Administration. Again, this would involve assisting you to value the Estate, apply for the Grant, collect in the assets, pay debts, finalise any tax affairs, transfer property and prepare Estate Accounts and thereafter distribute the Estate in accordance with the Intestacy Rules. At Jackson Quinn we appreciate that dealing with the Estate of a loved one after their death can be complicated and stressful and will deal with the Estate sympathetically, keeping you updated at every stage of the process. Beneficiary – someone who inherits under a will or intestacy. Executor – a person appointed by a Will to administer an estate.